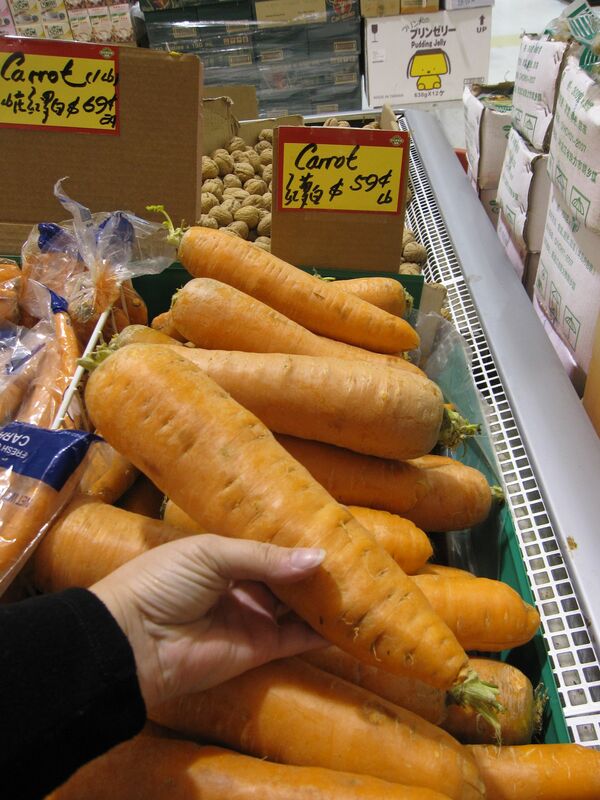 While I was out getting veggies at the local asian market for our rabbits last night I saw this GIANT carrot. I almost got it figuring it would last for several days but honestly it was quite scary. It had to weigh well over a pound! Not sure it was engineered to be that big or it is a natural carrot variety but I did not want to risk giving my rabbits some nuclear carrot. I thought I would ask about it but when I first asked them for fresh or bottled yuzu and really confused them I figured that I would not have luck with this either. (Note: yuzu is a citrus native to China and Japan that I read about on White on Rice Couple). So while I often struggle to communicate with the people who work there I get some good deals on veggies. I’ll keep looking into this carrot and hopefully I’ll find some yuzu.